Once Upon A Time – a Story started in late 2011 and finished Today! Once upon a time, there was a Bavarian money lender who, during 1923, split into separate companies at the height of German inflation. One arm of the company continued to offer banking services while the other started selling farming equipment to Bavarian farmers. By the 1960’s the company had become the biggest Bavarian distributor of tractors and combine harvesters and operated several hundred service centres across Bavaria. At around the same time diesel and engine oil gets added to the offer. In the 1980’s the company expanded into the building sector and started marketing all components required to build houses and commercial buildings. Following German reunification in the 1990’s the company then expands into East Germany and Austria. At some stage during that period three business segments emerge in which the company intends to become the market leader; these being the Agribusiness, Building and Energy sectors. Fast forward to 2011, the company in question BayWa Aktiengesellschaft is now spread over 14 countries and has recently announced that it has purchased Turners and Growers, subject to overseas investment approval. 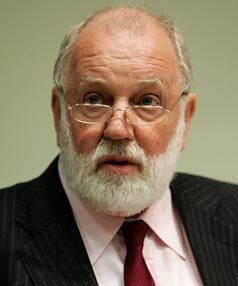 Posted: February 7th, 2013 under Germany, Industry Politics, Produce. You may remember the blog entry about munted expired Christmas trees flung indiscriminately off their balconies by Berliners in the weeks after Christmas. I have been asked whether I had made that story up as some Hortsource reader are clearly doubting Thomases. Politcal Footballs Are So Yesterday - How About A Political Christmas Tree Then? The short answer is, “No, it’s the thruth, honest, Gov!” Here is the proof. 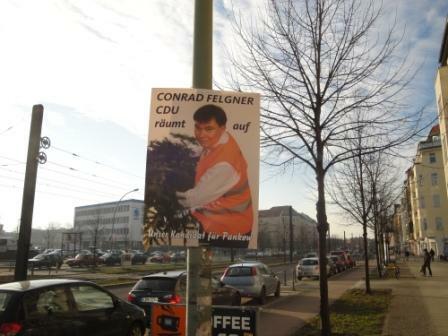 A couple of days after just about breaking my leg negotiating Christmas trees loitering on footpaths across the city, I came across this electioneering poster designed and displayed by the Berlin CDU – the conservative party of Chancellor Angela Merkel. It shows a candidate for the local body elections busy clinging to a Christmas tree. The caption reads – “CDU cleans up.” Abandoned Christmas trees are clearly a key political issue in Berlin, at least when it comes to local elections. Any lessons for our elections later this year??? Staying with the concept of interesting sights. 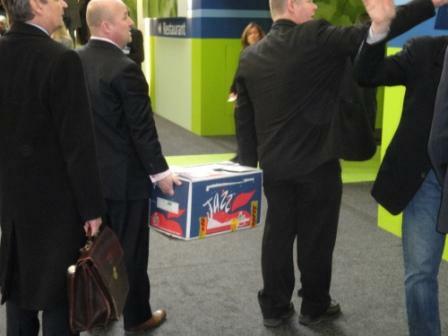 Here is a carton of Jazz apples taking a couple of its minders for a stroll across the Fruit Logistica exhibition. A fairly sterile affair, a trade fair. Everyone in his or her finery, spot lights on the product, every apple polished to make a good impression, crowds of people, no where to park the car, a need to get reaquainted with the concept called “winter coat” and “Garderobe”, the place where one needs to leave one’s coat in order to avoid suffering from overheating as one visited the fair. When one wants to understand though how the punters on the street feel about new fancy apple varieties or if one wants to understand the scope of the market we are exporting into, one needs to keep wearing one’s coat and mingle with the locals in a spot where the locals shop! 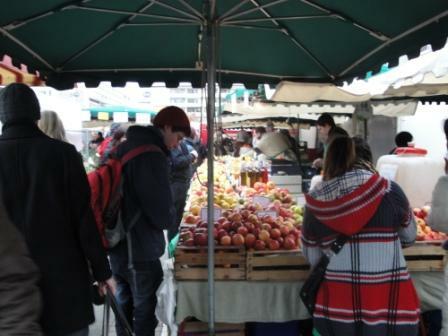 Like the Wochenmarkt – a German farmers’ market. 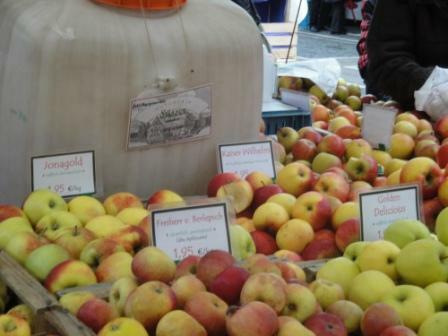 Apart from the aroma of Bratwurst and mulled wine which alone are worth a visit, one gets to see apple varities one did not even know existed. Many of these are heritage varieties, varities which existed when the old Kaiser Wilhelm was around – and you know what? People are buying them. The competition and the opportunity for our apple marketers is enormous! A traditional apple market like Germany does not make it easy for something new from the Antipodes like Jazz to turn up and say, “oi, move over. I am here now and want some shelf space”. We should therefore not undestimated the effort companies like Turners & Growers and others have to go to, in order to achieve a degree of cut through and exposure, particularly in mature markets like continental Europe where every consumer is an expert! Well done! On another matter , I am yet to find a decent Royal Gala I am happy to finish in the local market here in Auckland. What am I missing? Bad season? Somebody better put me out of my misery and come up with an explanation, because I can’t accept that I should have to eat substandard apples in a country that prides itself on its pipfruit quality! Posted: March 10th, 2011 under Conferences, Germany, On The Road Again, Produce. I received a letter in the mail from Tony Gibbs today. Not that I was the only one who was privileged in this way. Every shareholder of Turners & Growers would have received the same letter. Yes, you have heard right, Sauerkraut likes to keep his nose close to the wind and therefore invests in produce companies. Not that you will find my name on the share register – John Key and I both manage our investments through trusts. There are two significant differences though. Firstly, John Key has access to a smidgen more capital than Sauerkraut and therefore tends to purchase slightly larger share parcels– and secondly, there is nothing blind about Sauerkraut’s trust! Bu t I digress. Anyway, this letter arrived today inviting me to the Turners & Growers AGM. A couple of proxy forms were also floating around in the envelope and then there was this other letter. A letter from one Howard Cedric Zingel. If you now want to know who Howard Cedric Zingel is, you are asking the wrong cabbage head. A quick Google search reveals that Howard Cedric Zingel lives in Tauranga and seems to be someone who invests in the share market from a position of knowledge, being a longtime member of the NZ Shareowners Association Inc. So we have to assume Mr. Zingel takes his investing serious. And serious investor that he is, Mr. Zingel intends to propose a Motion at the 2010 Annual General Meeting of Turners & Growers Ltd on 24 June 2010. If you are interested in reading the Motion in full, you can satisfy your curiosity here, and if you want to know what Tony Gibbs thinks of the Motion you can check that out here. So there you have it. As the Board votes the majority of the stock, Mr Zingel’s Motion will be handsomely defeated. And this is where this story could stop. Posted: June 12th, 2010 under Produce Companies, Thoughtpieces.